Have you ever pondered the subtle differences between a BiDyke (By) and an Amazon (A)? Or a Nelly (Nl) and a Nancy (Ny)? Heteroflexible (Hf) and Down Low (Dl)? The Kona Katranya and Jen Crothers from Queeriodic Table have got you covered! 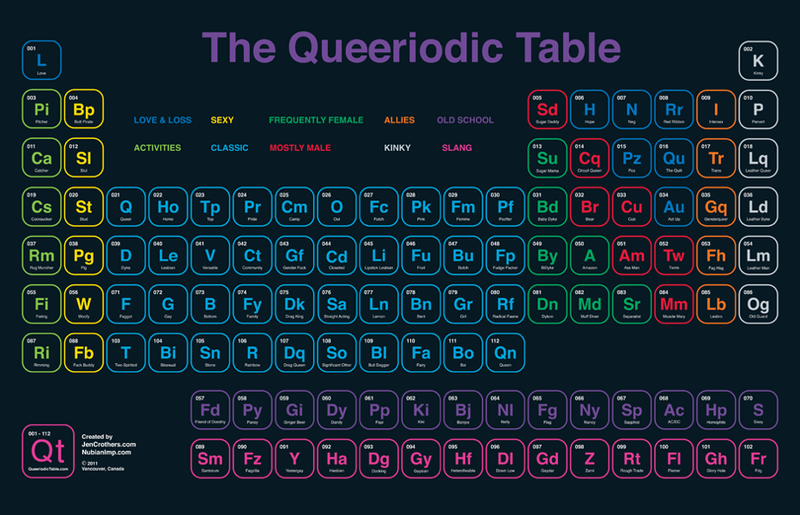 The philosophy behind the Queeriodic Table focuses on providing opportunities for people to ponder identity (their own and that of others), gender, sexuality, politics and science. Viewers are encouraged to rediscover what they think they already know and to consider what is present, and what is not. Those who have worked with it previously find themselves surprised by how many elements or how few represent who they are or who others think they are. And if you think this baby is a beauty, wait until you check out the zoomable interactive version of the Queeriodic Table HERE. Now shoo! Don’t you have clever status updating to do on Facebook using all of these new words you just learned?